East Coast vs. West Coast Burger Throwdown: In-n-Out vs. Shake Shack! Growing up in Southern California, In-n-Out Burger was a staple but always felt like a special treat. The first In-n-Out opened in 1948 and claims to have been the first drive-thru restaurant in the United States. Home of the Double Double (two patties, two slices of American cheese), In-n-Out prides itself on super fresh, never frozen ingredients and is believed by many West Coasters to have the best burgers anywhere. The In-n-Out menu is extremely limited - a few burgers, fries, shakes and sodas - but there are several "secret" menu items that you can order which utilize the same ingredients as on the regular menu but in more creative ways. 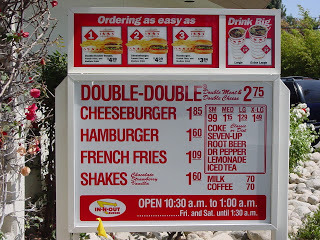 Whenever I go to In-n-Out, I order an "Animal Style" Cheeseburger, fries and a Diet Coke (mythical girl math: the Diet Coke cancels out the calories in the burger and fries!). "Animal Style" is one of In-n-Out's not-so-secret menu items - they take your choice of burger and cook it with mustard on the grill, add extra "spread" (an excellent Thousand-Island style sauce), lettuce, tomato, pickles and grilled onions. The menu - that's all! 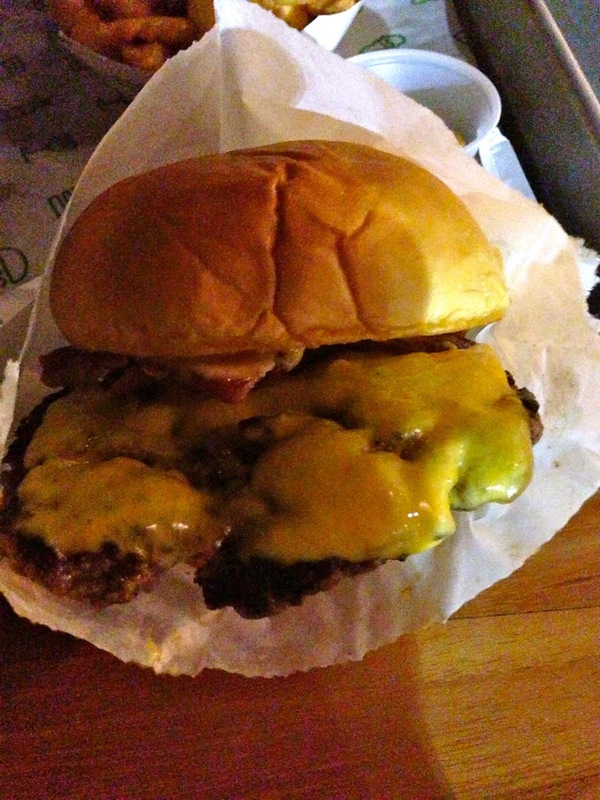 The result is a meaty, cheesy, crunchy (from the lettuce and pickle), extremely fresh, delicious burger. It's not too large and not too small - just the perfect size (each patty is two ounces, so a Double Double is a total of 1/4 pound of meat) and oh so good. The fries are literally made from russet potatoes cut by hand in the restaurant, fried and topped with salt. They are perfect if eaten right away, but if you let them sit too long and get cold they tend to become limp. Their shakes are made with real ice cream and are very, very thick and delicious. 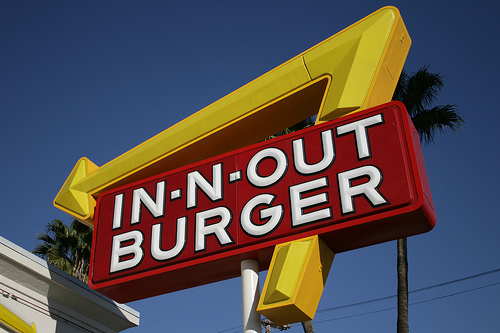 In-n-Out embodies so much of what it means to be a Californian. It is one of the things that people miss the most when they move away, and one of the first places they want to visit when they get off the plane at LAX. They have expanded to Nevada, Utah and Texas in the past few years, so one can only hope that they keep heading East! 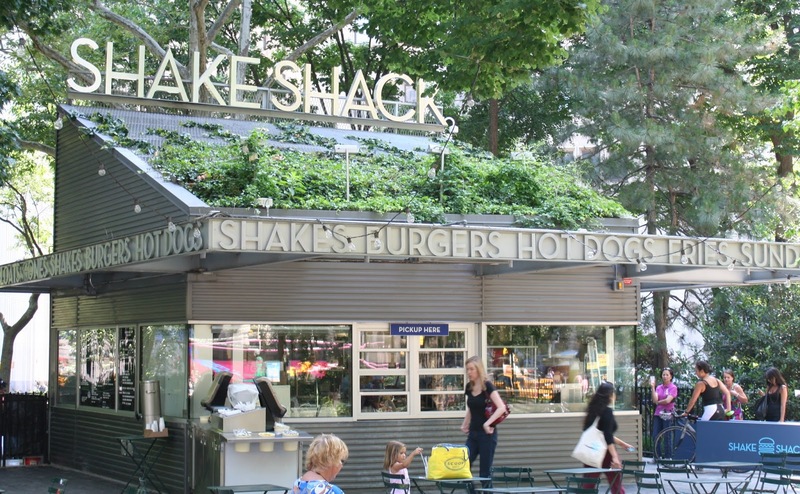 Shake Shack has only been around since 2004 but has already proven to attract a following that could very well be as devoted as In-n-Out fans in years to come. 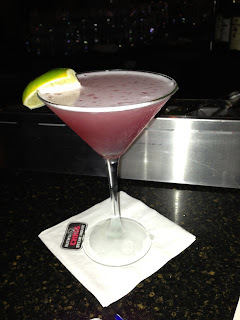 There are currently 20 East Coast locations and a few international ones, but I am sure they will continue to expand. Every time I have ever passed by a Shake Shack in Manhattan, the line of people extends well past the door and usually down the street. I always figured I would get there one day, and then they opened one up just down the street from where I live in Long Island, on Old Country Road at the new Gallery at Westbury Plaza shopping center. Last weekend, my husband and I were coming home from a night out and hadn't eaten dinner so we stopped off for some burgers right before they closed. This was a smart move. As expected, since this location opened in November 2012 I have never seen it not stuffed to the gills with people, the line 40-deep. So it was nice to be able to walk in and right up to the counter to place our order. Shake Shack is modeled after a "roadside burger stand" but the menu is decidedly gourmet and much more extensive than In-n-Out's. On the menu are several different types of burgers, hot dogs, frozen custard, custard shakes and concretes (like a Blizzard or McFlurry), beer, wine and even treats for dogs! All of the ingredients are very fresh and of the best quality, which is not surprising since it was founded by NYC restaurateur Danny Meyer of Union Square Cafe fame. I ordered a single SmokeShack burger, which features one beef patty (rumored to be a blend of sirloin, chuck and brisket), American cheese, Niman Ranch applewood-smoked bacon, diced hot cherry peppers and ShackSauce. The ShackSauce is a slightly spicy mayo spread that reminds me of a chipotle mayo. It is much more mayonnaise-y than In-n-Out's spread, which is much more saucy. The burger itself was much meatier than In-n-Out's and had excellent flavor. The cheese was melted very well and the bacon was very smoky and hearty, though not crispy enough for me. They used too many cherry peppers in my opinion - they ended up overpowering the whole burger. It was served on what appeared to be a Martin's potato roll, which is one of our favorites. All in all, a very good burger. Now on to the fries. 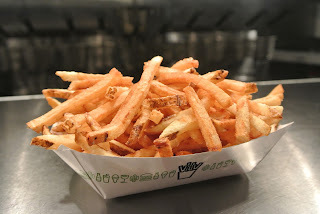 Shake Shack's fries are very large, thick crinkle-cut fries, which you don't see very often. 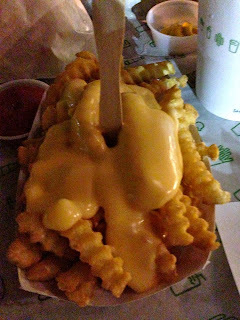 They are served either plain or with a cheddar and American-cheese sauce blend on top, with a wooden stick to eat them with. The fries were very good, although super rich. The cheese sauce was excellent and very addictive. However the portion was huge and we wished we would have only ordered one to share since we both left a lot of uneaten fries. Interestingly, Shake Shack recently debuted "Fresh Cut Fries" (i.e. In-n-Out style) at their Upper East Side location, and they will be coming soon to other locations. I am definitely going to return to try these babies, as they look like a complete knock-off of In-n-Out's. I did not try the custard, although I am dying to and will surely return to check that out. I enjoyed my Shake Shack experience and will go back and try other items, such as the Shack-cago Dog and a concrete. 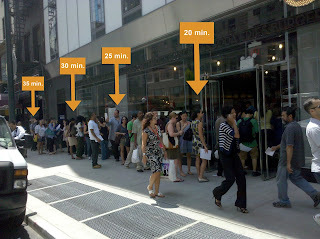 The constant long lines are certainly a turn-off, as are the high calories. But I would absolutely recommend this place to fulfill your burgers and fries craving any day. So...who is the winner? I realize that it's not really fair to judge Shake Shack after only one visit, but I have to stay true to my roots and say In-n-Out wins the bi-coastal battle of the burgers. 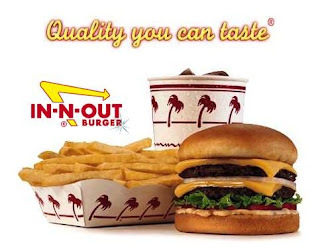 Their simplicity, freshness, uber-cleanliness, friendly and efficient service cannot be beat, and there is so much nostalgia associated with In-n-Out that I just cannot imagine choosing a new, trendy burger spot over good ol' In-n-Out! What do you guys think? Tell me by leaving a comment below!